As we stand on the cusp with a New Year spread out before us ready to be filled up with memories, the year behind us is already filled with memories some of which are easy to recall, key events or fun times, the special moments. Harder to recall are the ordinary moments, the conversations, the subtle changes in the children, those memories are still there stored in my memory bank but as one building an overall picture of the year. It would be impossible to remember it all, our heads would be over flowing like the magic porridge pot. Recording is a great way to keep memories alive, it's amazing what I 'remembered' when putting together the photo mosaic for this post. I took a small break from this blog this year, life got too busy to fit it all in and so I paused. Looking back at old posts to write this one there was a hole in the dialogue, one which I hope will not be there next year. I hope that I can make the time to write throughout the year in 2016, the record I make here is wonderful to read back on. One of the reasons that I had to pause in the summer was due to all the camping trips we had arranged. 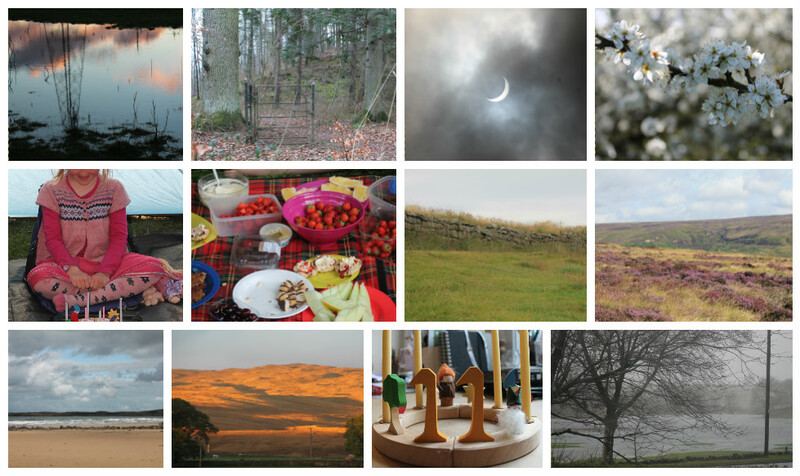 In August we spent more nights under canvas, on various trips, than we did at home. We visited some beautiful parts of our country, none of them far from home. We had short expeditions where we walked and carried all that we needed for a day and an over night. We visited interesting museums, historical sites and met lots of interesting people. We had tea one night watching a barn owl hunting. A few years ago we went on many camping trips and it was completely overwhelming, now that the children are older and help with the getting ready and setting up it is so much easier for me. I do hope that we can fit lots of camping into 2016 too. In March I attended a five week Maths Course. It is one of the subjects that I am most confident in but I am always open to new ideas and games and I definitely gained both on this course. What I also gained was the idea of doing a little bit of maths often. We have not had much structure in our learning until this year and Maths has been learnt but doing a small amount a few days a week has been amazing. It is now a regular fixture and the children are asking to do it each day! 2015 has not only been about Maths it has also been the year of the project. This time last year I introduced a new advent celebration into our house and as a result the children asked to do more project work this year. We have learnt about Astronomy, Planet Earth, Mammals and the Human Body, next year we are starting with the Weather. The children have also requested to start a nature book like the one we shared with the other families we did forest school with, we are going to start with the Silver Birch tree. Our project work has seen a huge improvement in writing and Alice's drawing. My mum has always supported me over Cameron's lack of interest in writing anything, maintaining that he will want to one day, that day seems to have come. I hope there will be lots more in 2016. Every year will always have its ups and downs and a down for us this year has been illness. We are fortunate to be blessed with excellent health despite my crohns diagnosis (it has been in remission for years). We have had lots of colds, fevers and coughs, and since September it has felt like we have been ill every week. We missed one of the best Autumn's we have had in years as one or other of us was ill each week. In December we spent four days in hospital with Alice who had pneumonia (I wrote about that here), December disappeared into a void, especially as I was really ill after we returned home. It meant a really quiet Christmas which was a good thing, we are all better now and taking things slowly and gently for now. I would like to say a huge thank you to everyone that has visited here this year. The connections I have made and the lovely comments I have received have been wonderful and so supportive. Thank you all from the bottom of my heart. So what about next year? In 2016 I want to continue to stay true to what I believe in and to look after my family to the best of my abilities. When I was a child it was the craze to have an autograph book and to get one's friends and family to write in it - my mother wrote "This above all to thine own self be true" and I have always tried to do just that as I know you do too. Stay true to your own beliefs and if you sometimes find yourself marching to a different drum to those around you so what? This is something I know but find difficult at times so is a case of don't do what I do but do what I tell you!!! My little star is hanging near your pretty card to remind me of your friendship. Happy New Year to you and your family and here's also wishing you good health in 2016. Wishing you and your family all the best for the new year - let's hope next year is a good one. it has been a pleasure finding your blog this year and I appreciate your visits and comments on mine - finding new friends is a good thing, yes! And a Happy New Year to you too :) despite some of the downs it sounds like it's been a great year and may 2016 roll in with adventures and blessings in equal measure! And it sounds like a perfect time to do a project on weather - it's all happening on your doorstep - I hope you're not in any danger of getting soggy! Sounds like a busy and good year (except for the illnesses!). Many good wishes for a full and happy new year and good health in 2016! I think blogs are a great way to record the day to day things, I do wish they were about when my two were little. Wishing you and yours all the very best for 2016. It was a true joy to come to your space in 2015! I wish you and your family strong health, amazing adventures and peace in 2016! I hope this year is full of better health for your family. Your children must love so much camping and outside adventure - that is fantastic that you are able to do that. Wishing you and your family happiness and better health. Happy New Year to all of you. I missed you a lot while you were gone from your blog last year. I know that life gets in the way, but I look forward to more of your blog in 2016. Yours is one of my very favorites and I was so glad when you came back. Moving from the old year to the new, we naturally focus on what's ahead. But, yes, it's good to pause, to reflect, to celebrate. Wishing you a happy and healthy 2016. Good luck to all your plans for 2016. I hope it will be a happy and healthy year full of fun, joy and fulfilment for you and your family. Hi there, I've only just come across to your blog ... having seen your name on the many I visit. Hope 2016 has started well, I enjoyed your mosaic here.